Having white teeth is a sign of a good oral health, but only when the whole tooth is white. If you see some white spots on teeth, maybe it’s time to question your hygiene habits and even go to the dentist for a check. While sometimes the reason why these different spots appear may respond to a simple issue, some other time could be a more concerning reason for decay, so it’s better to no let that pass. Let’s take a quick look at the causes, treatment, and way to prevent this annoying spots. 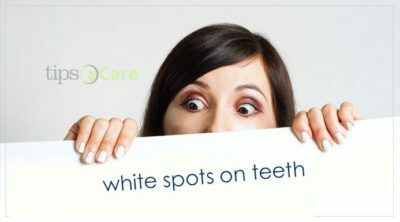 What are the causes of white spots on teeth? We’ve all heard that fluor is an excellent component to keep our teeth healthy, white and strong. That’s actually true, but as in everything, the excess is bad and too much fluoride can cause the opposite effect. If kids drink too much-fluoridated drinks or maybe enjoy eating toothpaste (we all know that those kid’s pastes taste really good) they may develop those white spots on teeth. This is one of the hardest causes to treat as the stains tend to be really strong. Yes, once again, “we are what we eat”. In this case, acid is the reason that causes the spots. Acid foods and drinks such as citric fruits and soda can cause erosion of your teeth enamel, which is the protective layer on your teeth. Sugar is another component that can cause those stains because when it’s consumed in excess, it creates an acid plaque that accumulates on the enamel and ends up corroding it. Finally, the acid reflux caused by a poor alimentation also leads to stains because it creates acid in the stomach, the throat and finally inside your mouth. 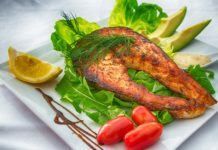 If you suffer from reflux or gastritis sooner or later you’ll develop the spots. This is one of the most concerning causes of white spots on teeth because it responds to a poor oral health and hygiene in general. This plaque is bacteria that accumulates around the teeth and make them decay if it’s not removed with enough use of brushing, flossing, and washing. Also, the use of braces, that limit the reach of the brush and floss, can develop in this white spots. It’s very common that teenager users of braces have these stains when they take their braces. But it also can happen to adults, especially if they had them for too long because the braces do really make it difficult for the hygiene products to cope. Enamel Hypoplasia responds to a lack of enough enamel to protect the teeth. This deficiency comes from malnutrition or mineral loss in the teeth. There’re several causes for this difficulty for absorbing minerals such as conditions like the celiac disease or smoking while pregnant. Also, taking a too long antibiotic treatment for any other condition can lead to weakened enamel. If you suffer from teeth sensitivity, grooves or lines, and also develop white spots on teeth, then you might be suffering from enamel Hypoplasia. These are the easiest to treat as they usually disappear by themselves. Sleeping with your mouth open causes dryness on your enamel, which may lead to the appearance of those spots. But as we mentioned, they will disappear in a few hours and if you treat the reason why you sleep with your mouth open, then they may disappear forever. In case they remain, they will probably be clear and easy to treat. 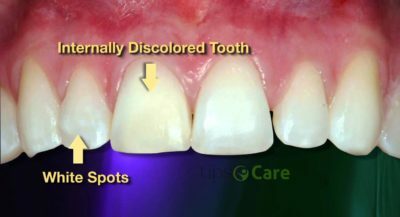 How to treat white spots on teeth? Bleaching: as the name implies, this process a professional dentist will use a bleach formula to lighten the general color of your teeth so it matches the stain. This procedure is delicate and won’t help with white spots on teeth caused by fluorosis. Make sure it’s done by a professional and that you don’t overuse it as it may cause decay or teeth to turn yellowish. Microabrasion: ideal mid-range stains, this procedure uses microabrasion to remove some enamel layers and make the stain disappear. It’s probably the most effective method but can only be used to certain point or you’ll lose all the protective layers on your teeth. Venners: a bit of an expensive procedure, but it’s the ideal when the white spots on teeth are too notorious and can’t be removed with other methods. Simple a porcelain veneer is permanently placed over the tooth so it looks like it’s completely white. Make sure the custom porcelain matches the tone of your teeth. Closing your mouth while you sleep: using gadgets as chin straps or taking nasal decongestants can prevent you from sleeping with your mouth open and lead to the permanent disappearance of those spots. How to prevent white spots on teeth? There’s no magic formula to prevent these stains but improving your hygiene and dietary habits can definitely help. Try eating less sugar and acid foods while brushing, and washing your mouth after each meal. And don’t forget flossing at least before bed. Also, in the case of children, it’s important to control the way they brush their mouth and let them know the consequences of swallowing the toothpaste. If it’s possible, manage by yourself the paste and only let a drop of it on the brush. 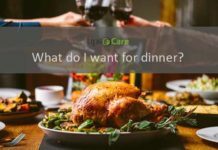 You may want to control what they eat, too. Finally, if you suffer from chronic congestion, allergies or are vulnerable to get colds, it’s important that you prevent or at least diminish the opened-mouth sleeping or the white spots on teeth that disappear after a few hours may end up being permanent and you’ll need to opt for any of the previously mentioned treatments. Remember our smile is an important part of our first impressions and also the entrance of our body, having it clean and healthy will speak a lot about ourselves and avoid us further complications.